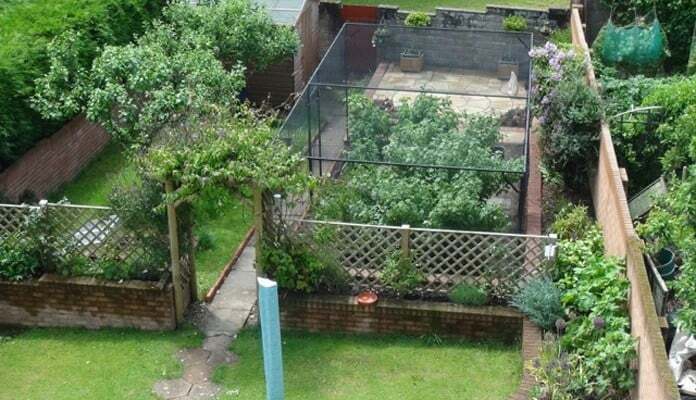 "We had to have a bespoke fruit cage because of the size, location and slope of the existing soft fruit garden. The fact that our location for the fruit cage was so demanding shows how excellent your bespoke design service is." 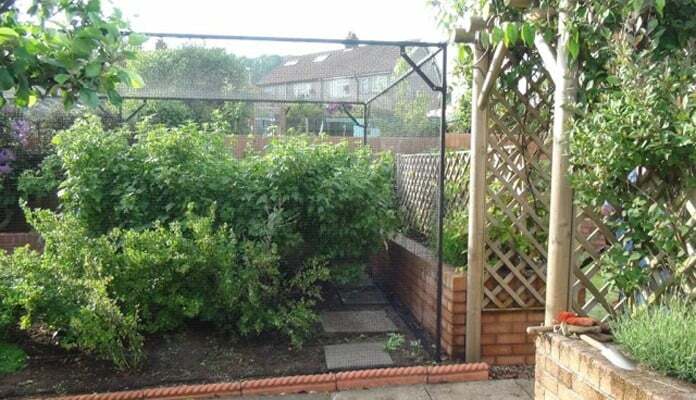 "We had to have a bespoke fruit cage (GDN-100) because of the size and location of our existing soft fruit garden. The existing, soft fruit garden is mature, the large blackcurrant (6') and gooseberry bushes are at least 15 years old and very productive. The site is bordered by existing brick retaining walls on two sides, a pergola and trellis, an existing concrete path with rope style edging and a paved patio with steps on the other two sides. The location was even more difficult due to it sloping both in length and width. (see photos). 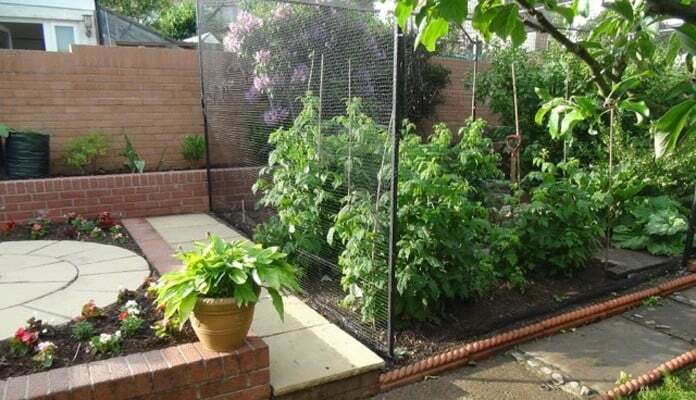 After email and telephone conversations with Harrods staff, I ordered the cage with dimensions to fit exactly the size of our soft fruit garden, within the existing permanent structures. This order was delivered in July 2012 but due to bad weather and illness, we did not erect it until May 2013. We are so pleased with it now that it is up. Everything on the extensive despatch note was in the various packages when we checked it. Although the 63 Net Clips worked well, we could have done with a few more. b) the blackbirds, woodpigeons and sparrows have taken a large percentage of our soft fruit in past years! The lengths of the upright bars and roof bars were exactly what I had ordered. The only problem was that, when measuring the dimensions of the area, I had not taken into consideration the size of the steel foot plates! The measurements were so exact that the extra cms. taken up by the foot plates meant that they would have overlapped the concrete paths and, more importantly, would have hit the brick walls surrounding the site. The result of this (my fault in not allowing for the size of the foot plates) was that we had cut 5cm off each roof bar to make the cage fit inside the walls. The various lengths of the vertical bars were correct to allow for the sloping site, except that one had to be cut short because of a large rock below the surface where it had to be placed. 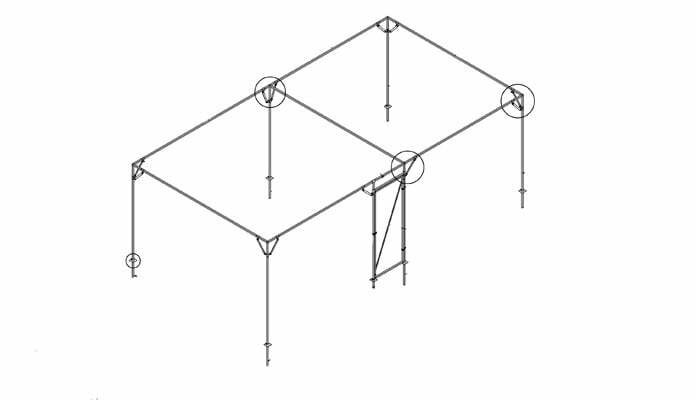 We found the tips in the video very useful, especially the one about assembling the roof first to mark the positions of the verticals. Mind you, we found it quite amusing to see the demonstrator in his 'smart casual' clothes erecting the cage on an ideal level site with no existing plants, walls or paving to avoid! His suggestion of needing two volunteers to put the roof on also made us laugh - we needed seven to do it - one for each vertical! measured bars and the quality of the engineering in producing all of the many parts. 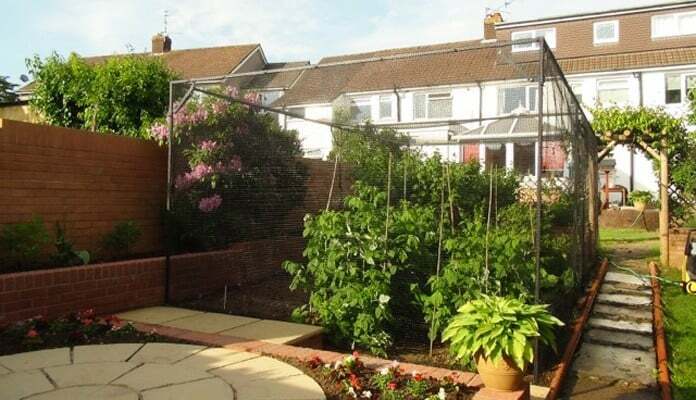 We now have a very good looking and functional fruit cage of professional quality, but it does have several critics - the blackbirds, sparrows and wood pigeons! them, erection of the cage would, in our case, have been extremely difficult. c) that about 10 extra Net Clips would have been useful. Thanks for the excellent quality of the product, including the extensive and very accurate instructions. The fact that our location for the fruit cage was so demanding shows how excellent your bespoke design service is."